Velbon's FHD-51QN is a heavy duty fluid head made from aluminium which is ideal for standard DSLR cameras and spotting scopes. 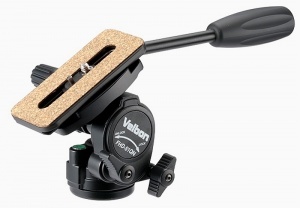 It features a 2-Way 180 degree tilting action and 360 degree panning. Tilt and pan functions are controlled by individual locking knobs and the quick-release platform features a sliding mechanism, to allow the centre of gravity of a camera or scope to be adjusted. Also include is a bubble level and a reversible pan-handle for right or left handed use.